Andy Marshall changed downtown Columbia when he opened a Puckett’s Grocery & Restaurant on the square. The businessman’s plunge in 2013 ignited a fire that has turned Columbia into a destination for shoppers, diners and concertgoers. The square has expanded from being a place mostly for county workers, lawyers and financial offices into quaint shops, apartments and music venues. “When we got this news about Puckett’s restaurant coming to the square, it perked us all up,” remembered State Rep. Scott Cepicky, R-Columbia, a former Maury County commissioner. The CEO of A. Marshall Hospitality brought support of the community and local charities with him as he opened his doors. 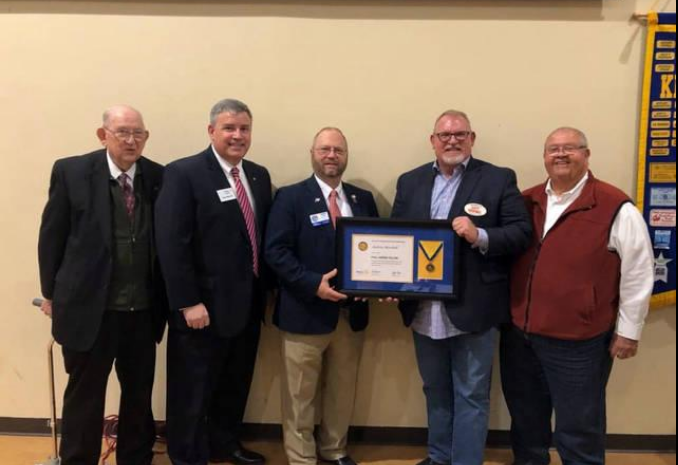 He was honored for that civic-mindedness Friday by three different groups — Blood Assurance for his sponsorship of the annual “Lifesaver Challenge,” the state legislature for his services “to the citizens of Tennessee” and the Breakfast Rotary Club with a Paul Harris fellowship. The Kiwanis Club of Columbia hosted the surprise presentation, which was arranged by the Blood Assurance Advisory Board. Blood Assurance, the supplier for Maury County Regional Medical Center, sponsored a friendly competition between Kiwanis and Rotary to see which group would have the most blood donors in the months of December and January. It ended in a tie. State Reps. Cepicky and Michael Curcio, R-Dickson, presented Marshall with a resolution from the General Assembly, signed by Gov. Bill Lee; Lt. Gov. Randy McNally, R- Oak Ridge; and House Speaker Glenn Casada, R- Franklin. Marshall was born in Memphis and moved to Franklin at age 13. He learned the grocery business with his father, Clifton H. Marshall Sr., and graduated from Middle Tennessee State University’s Jones business school. He purchased his first business, a Piggly Wiggly supermarket in Hopkinsville, Ky., at age 26, and eventually owned others in Tennessee. Marshall sold all of his supermarkets and went into the restaurant and hospitality business in 1998, starting with his first Puckett’s location in Leiper’s Fork. His Columbia location was his fourth of five after Leiper’s Fork, Franklin and Nashville, and he added a Hattie Jane’s Ice Creamery here in 2017. Puckett’s provides the venue and food for the Boys & Girls Clubs’ Great Futures Luncheon. That event is April 17 this year, featuring Gov. Lee as guest speaker. Cepicky, elected to his first term in the legislature in 2018, reminded the audience of the lingering effects of the Great Recession in 2010, 2011 and 2012. Marshall told the audience of future expansion efforts. Puckett’s opened game-day locations at Nissan Stadium, working with the Tennessee Titans, and at Vanderbilt’s, MTSU’s and UT-Chattanooga’s football stadiums. Puckett’s eventually will have locations on Concourse D at the Nashville airport and in Pigeon Forge, he said. See the original article on the Columbia Daily Herald website here.